For round two of the *Eventseeker Presents* show series, we’re bringing you a free evening of experimental freak pop and theatrical rock and roll from all over California! 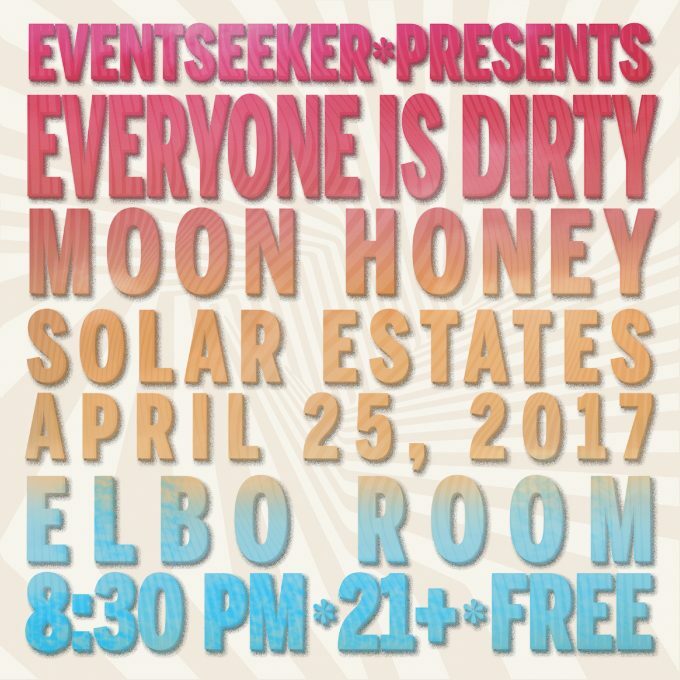 Everyone Is Dirty, Moon Honey, and Solar Estates are coming together a week from today. Once again, this is a FREE SHOW. So round up all your friends, RSVP on Facebook, and be ready to get freaky! Please note, this is a 21+ show. No one under 21 will be allowed inside the venue. Everyone is Dirty is a rock band from Oakland, CA that uses elements of grunge, art rock and psychedelia in its music. Led by singer and violinist Sivan Lioncub, the band immediately stood apart in the San Francisco Bay Area after releasing its debut single, “Mama No!” in 2014. Everyone is Dirty dropped its debut album, Dying Is Fun, later the same year to local acclaim from both critics and fans. The band spent the next few years touring and earning a national following with its signature symphonic rock and roll. Before embarking on its first national tour in 2016, Everyone Is Dirty dropped the landmark single, “Banana Split,” signaling a turning point in the band’s already distinctive songwriting. Solar Estates is an indie pop project based in Chico, CA. With an ear for minimal electronics and and classic pop songwriting, the band dropped its debut EP The Quiet Season, in 2014. After spending the next year paying its dues on the Northern California club circuit, Solar Estates honed in on its own distinctive blend of traditional and futuristic pop laced with soul and experimental. The band captured this signature sound on the 2015 EP, Lines.